There are three main fruit family types featured in this report on the global fruit pulp market. These fruit family types include berry fruits, exotic fruits, and orchard fruits. Berry fruits include blueberry and strawberry while exotic fruits are the likes of mango, papaya, apple, guava, passion fruit, and pineapple. Orchard fruits include peach, kiwi, and pear. Most of these types of fruits are used as pulp in baby food as the taste and consistency of fruit pulp is suitable as food for infants. This is driving the popularity of fruit pulp and consequently boosting revenue growth of the global fruit pulp market. Of these fruit family types, the exotic fruit segment is expected to be the largest in terms of revenue, estimated to be valued in excess of US$ 600 Mn by the end of 2017. In terms of volume consumption, the exotic fruit segment is projected to be pegged at 675,280 MT in 2017. With an estimated 57% market share in 2025, the exotic fruit segment is anticipated to lead the global fruit pulp market throughout the forecast period. The shelf life of fruit pulp is longer than fresh fruit. Frozen or chilled fruit pulp retains all the vitamins, minerals, and proteins obtained after processing the pulp. A longer storage life without much alteration to the natural content and flavor is a main factor boosting global market demand for fruit pulp. A longer shelf life also means reduced transportation and storage costs, and this factor encourages manufacturers to increase production of fruit pulp. Also, fruit pulp possesses the same properties (taste, texture, flavor, color) as fresh fruit – in fact, fruit pulp imparts an enhanced color and taste to the finished product. This is another main factor driving the demand for fruit pulp in the global market. Pulp/puree is used as a sweetener in various food products such as snacks, juices, yogurt, and baby food, and also in ready-to-drink smoothies. Food producers are moving towards producing fruit pulp based food products owing to the enhanced properties of fruit pulp. This factor is also fueling revenue growth of the global fruit pulp market. A growing demand for super fruits has been observed in some parts of Europe. Several processors of fruits are developing new fruit pulp products made from super fruits. Also, in some countries of the Asia Pacific, fruit extracts in the form of pulp and puree are being witnessed in great demand across multiple applications. 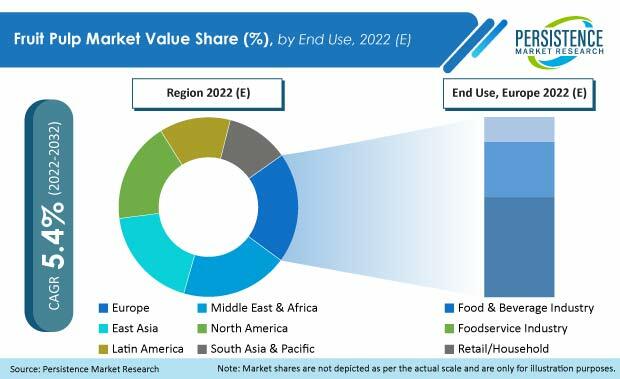 In the last few years, an increasing trend towards the consumption of processed and packaged food products as well as a rising consumer preference for functional food and non GMO food products is being noticed across the world. This has prompted food manufacturers to produce processed foodstuff using fruit pulp, puree, and concentrate. The global demand for fruit pulp from manufacturers of fruit based beverages has increased over the years, owing to the growing use of fruit pulp in beverages to enhance the taste and flavor. All these factors are acting in favor of the global fruit pulp market and boosting both global market demand and subsequently revenue generation. SUN IMPEX INTERNATIONAL FOODS LLC. Mor Mukat Marketing Pvt. Ltd.